The Braves enter the All-Star Break at 42-45, 9.5 games out of the Eastern Division and nine games behind the Rockies for the second Wild Card spot. Two other teams, the Cardinals and Cubs, are a half-game in front of them. Their expected win-loss record is actually worse at 39-48, a product of a bad pitching staff. How did we get here? Here’s a timeline of the first half of the season. April 3: Opening day and the Braves fall 6-0 to the Mets. Their opening day roster included Emilio Bonifacio and Eric O’Flaherty, two guys the Braves brought back after they both struggled in 2016 for Atlanta. Not on the roster is Sean Rodriguez, who some believe will miss the season after he was involved in a car accident with a drunk driver. April 17: After losing six of their first seven ballgames, the Braves won five consecutive games to pull to .500. This streak was capped off by a four-game sweep to open SunTrust Park, including a walk-off 5-4 win against the Padres after Dansby Swanson singled with the bases loaded in the bottom of the ninth to finish the series. The Braves were 6-6 on the year. They would lose their next six straight and have yet to get back to .500. April 19: In a sign of things to come, Julio Teheran is hammered for seven runs over four innings against the Nationals in his second start at SunTrust. In nine home starts during the first half of the season, Teheran allowed four or more runs six times. He only allowed that many runs in nine road starts once. The Braves have won only two of Teheran’s home starts and have lost just two of his road starts. April 29: The Braves score double digit runs in back-to-back games for the only time this season as they beat the Brewers 10-8 and 11-3. The first victory came after Bartolo Colon and Jason Motte combined to put the Braves in an 8-4 hole entering the seventh. Freddie Freeman finished the comeback with a two-run homer in the top of the ninth. May 10: Atlanta concludes a low point in the season as they follow up the two wins against the Brewers mentioned above by losing eight-of-nine games to drop to a season-worst nine games under .500. This included a 16-5 bloodbath at the hands of the Mets on May 3 in which Colon gave up five runs in four innings. Of his 13 starts with the Braves, Colon surrendered five or more runs eight times – including his final four starts. May 17: The Braves have righted the ship, winning five-of-six, but the fifth win was a costly one as Toronto Blue Jays pitcher Aaron Loup nails Freddie Freeman on the wrist during his fifth-inning at-bat. Freeman is immediately removed and further tests reveal a fracture. He’s originally expected to miss at least two months. May 20: John Coppolella decisively acts to fill the hole created by Freeman’s injury as he acquires Matt Adams from the Cardinals. Adams, who had lost essentially all of his playing time after the Cardinals moved Matt Carpenter to first, makes an immediate impact with the Braves. In his second game, he blasts a two-run homer in a 5-2 win over the Pirates. The next night, after Jim Johnson blows a save, Adams finishes a two-run rally with an RBI walk-off single. He had also homered in the game. June 7: Three days after scoring 13 runs, the Braves set a season-high with 14 runsagainst the Phillies. Nick Markakis picks up five RBI with three doubles while Matt Adams and Dansby Swanson each homer. Mike Foltynewicz throws seven shutout frames – though the Braves offense didn’t need such excellent pitching. June 10: Atlanta plays their only double-header of the first half and drops both games to the Mets. They scored just two runs and waste Sean Newcomb‘s debut. The lefty was masterful over 6.1 innings. Only an error, charged to Newcomb, led to a run. He walked two and struck out seven, but takes the loss. With a Game Score of 68, it is tied for the eighth-best major league debut in Braves history. June 12: The Braves make Kyle Wright the fifth overall draft choice of the 2017 Draft. Wright, the ace of the Vanderbilt staff, was lauded for his pitchability, stuff, and potential for a quartet of plus pitches. They would later add Drew Waters, a player with potential five-tool skills. The Braves showed with this draft that they were willing to play the hand that was dealt to them. A year after championing the quantity of prospects from a deep draft, they aimed at hitting on a few quality picks in this year’s shallow draft. June 17: Jaime Garcia gives up six runs, but the Braves win 8-7. It was the beginning of a bad streak of games for Garcia to finish the half. Including this game against the Marlins, Garcia surrendered five or more runs in four consecutive starts with an ERA of 9.41 during those starts. The Braves offense bails him out enough to win two of those games, though. Before the streak, Garcia looked like this year’s Shelby Miller with a record of 2-5 and an ERA of 3.16. June 21: Braves walk-off for the third time in six days and for the sixth time during the first half. After Arodys Vizcaino and Jim Johnson blow a two-run lead – again robbing Newcomb of a win – Matt Kemp hits the third homerun of the game for the Braves, a two-run bomb to lead to a 5-3 win. The previous weekend, Brandon Phillips had smoked hits through the Marlins infield to win in walk-off fashion in consecutive days. The Braves would follow up the Giants walk-off win by winning their next three to get to 36-38. June 30: Mike Foltynewicz comes oh, so close to history. He tosses eight no-hit innings before a homerun to open the ninth breaks the hearts of many Braves fans who had stayed up late to watch and listen to the game in Oakland. What made the result even worse was that it looked like Foltynewicz had gotten a strikeout earlier in the at-bat, but the umpire disagreed. Foltynewicz throws 119 pitches during the game and in addition to the one hit allowed, he walked four and struck out eight. 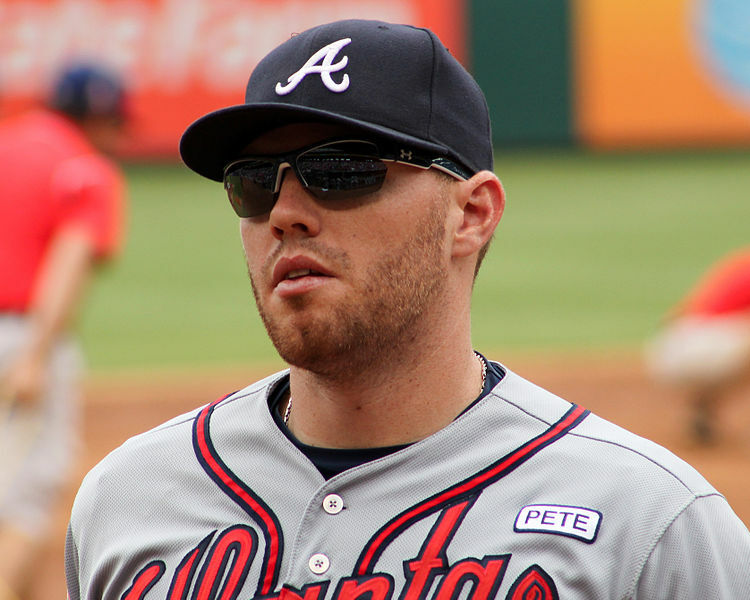 July 4: Originally expected to miss at least two months, Freddie Freeman returns after just 44 games to face the Astros on Independence Day. To help the team, Freeman volunteers to move to third base to keep Matt Adams in the lineup. Atlanta goes 24-20 without their best player. Unfortunately, the Braves will get demolished 16-4. The next night is nearly just as demoralizing as the Braves get beat by possibly the best team in baseball, 10-4. Also on the fourth, the Braves officially released Bartolo Colon. He lasted 13 games with the team. July 7: With Braves fans excited about their team’s prospects for hunting down the Nationals, Jim Johnson falls apart in a 5-4 walkoff loss to the NL East leaders. Atlanta had a chance to once again get to one-game under .500, but Johnson, who has struggled this year when used on back-to-back days, blows a three run lead. Ian Krol finishes the sad effort by giving up a walk-off hit in the tenth. July 9: A day after smashing the Nationals 13-0, the Braves finish with a disappointing split of their final series against of the first half after losing 10-5. Atlanta will be back in action on Friday as they welcome the Diamondbacks to Atlanta for the beginning of a six-game homestand that will also include the Cubs.